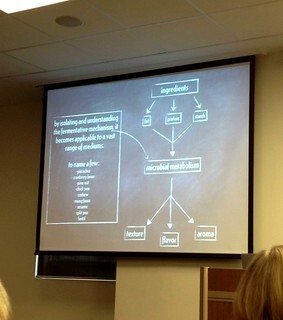 This was the miso lactofermentation flow chart breaking down the components of the process. Interesting to note that this "discovery" allowed the team to explore the use of other substrates to make the "koji" and resulting "miso". Both Dan Felder and Ryan Miller from Momofuku Culinary Lab in New York came to participate/present at UofT’s Thinking About Dinner workshop at The Jackman Humanities Institute Program of Arts. The two day workshop showed, rather revealed, the strong influence both soft and hard sciences have in how food is presented and in cooking. Fascinating stuff for the food loving scientist me.